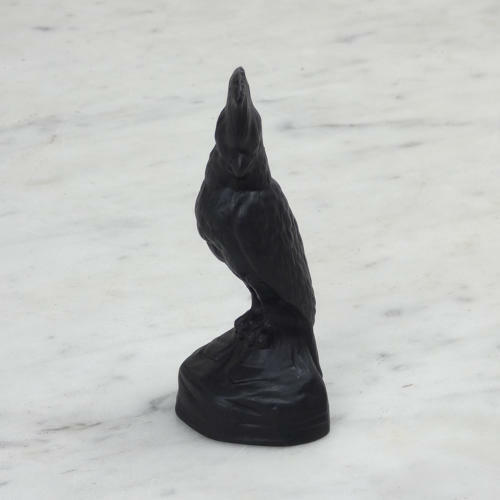 A small basalt figure of a cockatoo. This is marked 'WEDGWOOD MADE IN ENGLAND' and it dates from the 1930's. This figure is one of a series of animals that were designed by Ernest Light, for Wedgwood, in 1914 and they were very naturalistically modelled. They were produced again in the 1930's. The earlier run had glass eyes and when they were re-introduced in the 1930's the eyes were moulded in the basalt. This piece is quite well modelled but the detail is not as good as the earlier versions. It is in excellent condition.